Brown_Square_Envelopes is rated 4.4 out of 5 by 5. Rated 5 out of 5 by CECE from Let's hear it for BROWN!!! I make my own holiday cards. This year a neighbor took a photo of our home while it was snowing. We were in Florida. The photo is rather grey, beige and brown. When I print it out it fits these envelopes perfectly. Great presentation. Square Invitations are trendy and fun. They’re innovative and original. But finding a square envelope to match may be challenging. 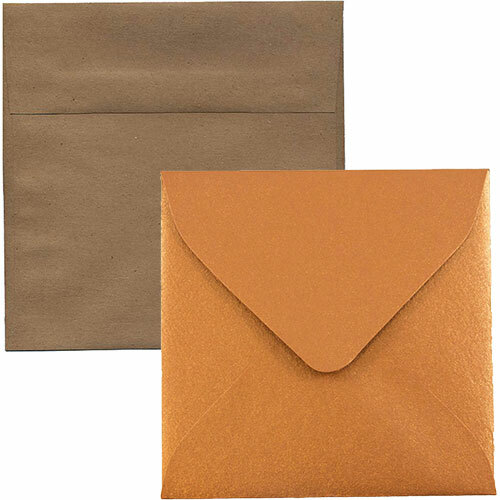 That’s why we provide Brown Square Envelopes in 9 different sizes and several different brown styles. You’ll not only find a square envelope, but choose your favorite from a large selection. Brown Envelopes look good with all color variations. So no matter what your invitation looks like you'll find an envelope to compliment it. Brown Square Envelopes come in shiny metallics, polished dark tones, and classic Kraft paper bag style. The range of envelopes offered makes choosing an envelope, instead of finding an envelope, the challenge.